Download book, click on Youtube, start today! 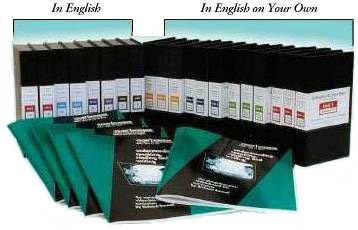 Travel, call, fax or skype with author of In English! created by teachers who use In English. For us, IN ENGLISH has been a benchmark builder. The enthusiasm of our English Language Learners enrolled in the CBET Personal Tutor and Video Check-out Program is so infectious we've added six new sections this spring. Put this effective video-based ESL series to work for your program. It has already proven successful in thousands of classrooms across the U.S. These beginning-level units of IN ENGLISH are a series of 24 half-hour video lessons, accompanied by a workbook and supplemental material. On-screen instructors introduce the video segments, demonstrate workbook readings and lead viewers through written and oral exercises (see IN ENGLISH program sections). Now, Unit 1 is available on YouTube, and workbooks can be downloaded for each segment as well. The series is organized sequentially, and the vocabulary and sentence structure are controlled to give the learner success at each level. Click here to see the structures presented in each unit. Distance Learning programs that lend the videos to students are seeing remarkable student learning gains and automatic family involvement. The additional time on task students receive by viewing the videos at home provides critical practice and reinforcement that cannot be achieved through other means. Libraries that circulate these self- instructional videos report high interest and extensive use. By focusing on informal conversation and continuous spiraling up from previous material, IN ENGLISH makes learning manageable and enjoyable. Scene: video tour and narration contextualizing new vocabulary and structures. Vocabulary: skits and visual definitions of all new vocabulary. Dialog: a serial drama stressing natural, informal conversation. Pronunciation: clear enunciation of all new vocabulary words. The characters, story-line and language development continue throughout the series, Units 1-12. Units 5-12 are presented in a more "concentrated" format, omitting the on-screen instructors and workbook exercises. Learners will spend more time reviewing each of these rich videotapes. I have used IN ENGLISH in Distance Learning for the past year and have been very satisfied with the quality of the material. My students have responded with enthusiasm, and the CASAS results are impressive. The topics gradually advance from the present tense of the verb "to be" to the present perfect progressive and reported speech. These steps are methodically integrated with the introduction of a 1700-word vocabulary, conversational phrases, and colloquials that relate to everyday life in the USA. Designed for adult education, adult ESL and high-school ESL classes, the program is often used to teach families with the full range of ages. The visual dictionary and "soap opera" segments integrate fun and humor into the carefully structured language instruction. The series has proven successful with large classes, one-on-one tutoring, distance learning, literacy and refugee/amnesty programs, and in numerous other settings. Created by Richard Bourell, an ESL teacher with twenty years teaching experience in the USA, Mexico, and Europe, it has earned enthusiastic loyalty from teachers across the USA. QUESTIONS, SUGGESTIONS? Send us an email. Call us from within the USA, toll-free at (800) 367-3806. Send us a letter at P.O. Box 3726, South Pasadena, CA 91031-6726.